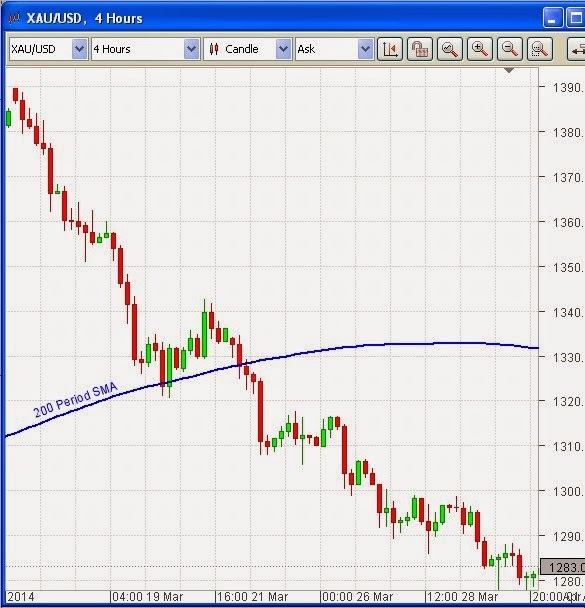 OmiCronFX : Gold still falling sharply | Is the Euro due for a hit today? Gold still falling sharply | Is the Euro due for a hit today? There have been a number of mixed messages around the fate of the US dollar recently. While it has been suffering against a resilient Euro, it has managed to power ahead in relation to the Japanese Yen. Short term bond rates have been falling to record lows which, as we reported, is bullish for the Greenback. The price of oil is in decline, which normally goes hand in hand with a stronger US unit. All of this is in the context of the much heralded tapering of Quantitative Easing in the US. But there is one measure of dollar strength or weakness that continues to throw out only one signal, and that is the price of Gold. Those who can only see an upward trajectory for the precious metal have been relying on geopolitical tensions over Ukraine, abnormal weather patterns in the US, perceived demand for physical gold in China and India, and whatever you are having yourself in order to bolster their position. But it keeps on falling. Is the Euro due for a hit today? Towards the end of the London session yesterday it looked like the big boys were taking a view that the European Central Bank deliberations later today will be something of a negative for the Single Currency. Our Mandelbrot algorithmic routine has come to the same conclusion and it has taken a position on the short side in EURUSD. A look at the four hour chart above will confirm that a downtrend is in place (Lower highs and lower lows). It can be seen that while back on March 20th price action was rebuffed by the 200 period SMA (blue line) it has broken through it since then, and with some conviction in the last hours of yesterday’s London session. 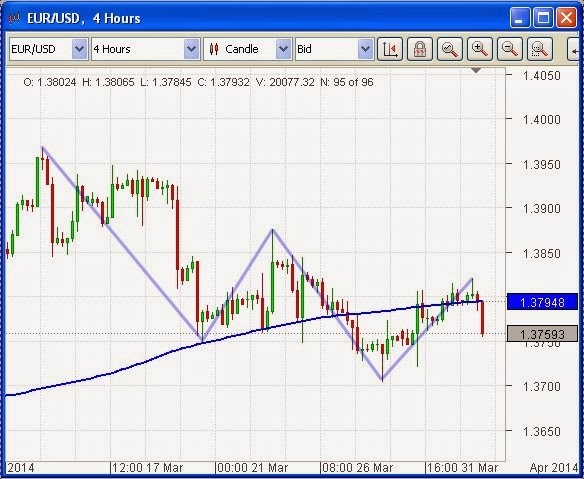 The fundamentals for EURUSD are also bearish. While the pair has been powering upward even in the teeth of the realization that tapering in the USA is a done deal, there are indications that the Euro zone monetary authorities are growing more and more concerned, not just about the risk of deflation which now officially exists in some of the peripheral member states, but also about the very high and chronic rate of unemployment in Europe as a whole. The traditional measure for dealing with these issues is Quantitative Easing, or something that approximates to it and that has the same effect. QE in Europe is not as easy as in the USA or Britain because there is not one bond issuing authority like there is in those jurisdictions - each member state issues its own and they all have different characteristics. So any bond purchasing program would be complicated in the extreme. The ECB, however, has proved itself to be very resourceful in these matters in the past. There seems to be something of an expectation on the part of Forex market participants that it will prove to be so on this occasion as well. Such a measure would be calculated to weaken the Euro.